The enduring popularity of comic book adaptations at the Box Office is continuing on our televisions. DC has been doing well in the teen market for years. First with Smallville, then Arrow, and this year Arrow is getting a spin-off for a share in that same market with The Flash. But what about older audiences? These teen-centric tales, heavy in the melodrama and teen angst, fall a little flat for many comic book fans. Marvel has found it’s audience with Agents of S.H.I.E.L.D., so why shouldn’t DC give it a go? The year of the 75th anniversary of Batman seems like the perfect year for DC to try their luck with Gotham. In the cinema, Batman has gone through quite a dramatic change. Tim Burton’s Batman was a blend of dark and camp before moving on to the ridiculously silly and over-the-top action of films like Batman Forever and Batman & Robin. Then came Christopher Nolan, who felt that Batman should be all dark. 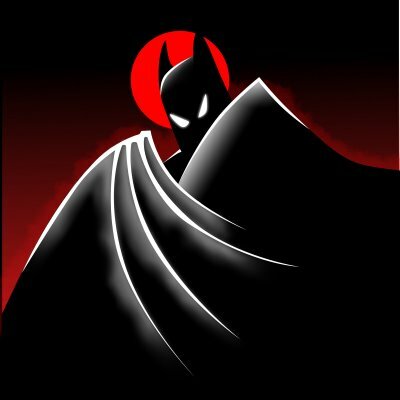 On TV, Adam West’s fun, camp version of Batman has lived on with cult status, while the animated series fully embraced that noir detective side of Batman’s character. So where should a new series based on this epic source material position itself? And could it really have something new to say? What do audiences even want from TV shows adapted from comic books? Comic book characters and series are constantly reinventing themselves. Most of the big characters have been appearing in comics since the 40’s and 50’s. They would have to think of something new to keep their readers hooked for all those years. With each new writer the stories take on a new tone and direction, origin stories are reinvented, and settings are thrown on their heads. Each new artist also brings his or her interpretations to the characters – changing how they look, the colour palette used for the series, changing the levels realism or exaggerated cartoonish-ness to suit the tone. Each of these new iterations is an adaptation in itself. Adaptations that seemingly have limitless powers to use and abuse the original premise and story as they see fit. This tradition creates an interesting backdrop for audio visual ‘adaptations’, having them fall into a category similar to productions of plays rather than an adaptation of a novel, for instance. This source material is meant to be reinterpreted. As such, creators of films or TV series based on comic books have an unprecedented creative license in their adaptation. Not only will fans expect a certain amount of difference to the original, they want it. What’s the point of simply reproducing it in any kind of exact manner, how would that be interesting? Early reviews of Gotham have commented on the liberal ‘interpretation’ of the source material and origin stories for many of these characters, but I think they are missing the point. If Gotham was a new story being written for the comic book, the changes would be exciting – a new version of these iconic characters – so why should a TV series be any different? Changes to the origins give the story a potential for more interesting future storylines. If it was going to follow the source material (whichever particular timeline/universe it followed), there would be no surprises. As it is, a number of surprises await us, and I’m looking forward to discovering what they are. Gotham is taking an approach similar to Marvel’s Agents of S.H.I.E.L.D. in that the focus is on the common folk, not the super heroes. 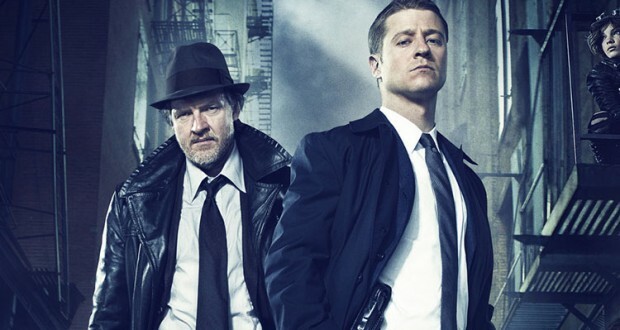 The central storyline for Gotham is James Gordon’s rise through the ranks of Gotham’s police department. An ordinary man fighting for good in a city full of darkness. Along with Gordon’s rise to Police Commissioner, the series explores the origins of a number of heroes and villains in Batman’s world. Gordon (Ben McKenzie) and his partner, Harvey Bullock (Donal Logue), are the first on the scene to the murder of Mr and Mrs Wayne. While Bullock wants off the case, not wanting to draw the heat such a hot case would create, Gordon instantly relates to Bruce and wants to bring justice to the Wayne’s killer. In the course of the investigation, Gordon discovers that the corruption of Gotham city doesn’t stop outside the police department doors. He is determined to fight from within, trying to make Gotham a better place. Pilots have a tough time. They need to have enough in the first episode to hook both the general audience and the studio execs before it even lands a spot on the network. As with many pilots, Gotham tries to cram in way too much into the one episode. There is no need for that. On the other hand, it does give the audience a hint that we will see a lot of Gotham’s famous characters throughout the series’ run. Some have been arguing that there was no need to show the murder of the Waynes yet again (a story EVERYONE knows by now and has been done to death). But I disagree. 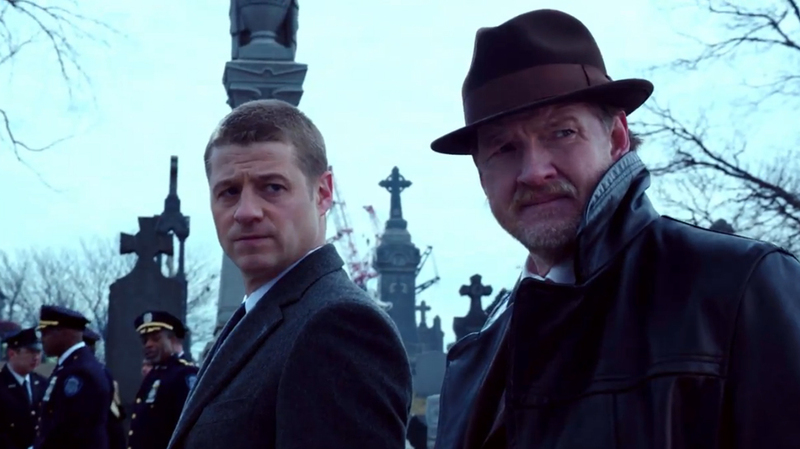 The way that Gotham played the murders was important to Gordon’s character – his first investigation as a detective, his personal connection to Bruce, and his unwilling involvement in police corruption. All of these issues will be central to the theme of the show as well as to Gordon’s character. This focus on an ordinary man within a fantastical world, stacks all the cards against him. How on earth could James Gordon really overcome the evil that lies within Gotham? Well, that’s the question that will have you tuning in week after week. That and how can he remain so morally upstanding through all of it? The most disappointing aspect of the pilot was how obvious all the introductions were. There is something to be said for subtlety, even when it comes to superheroes and villains. Just in case you had any doubts as to who the teenager with the cat-like movements was, she also goes out of her way to feed cats as well (although if she really was a cat lover she might know that most cats are lactose intolerant… just sayin’). 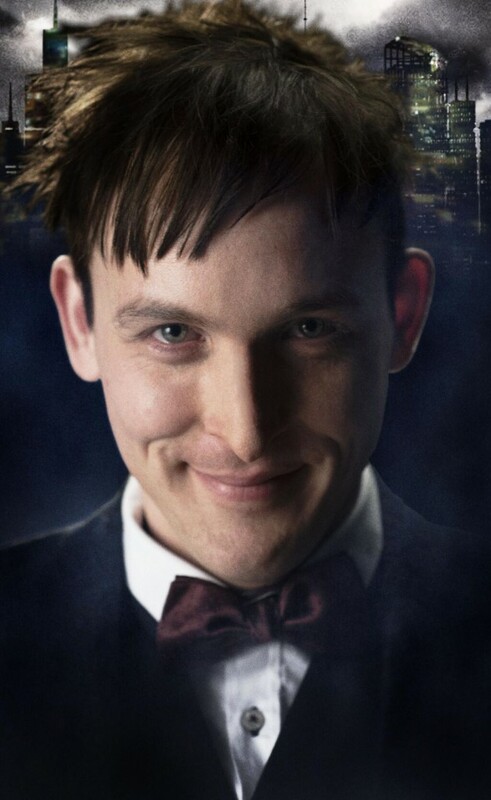 When we first meet Penguin his mannerisms are more than enough to tell us who he is. But the writers clearly think we are far too dimwitted to pick up on that, so they make a big deal out of his nickname as ‘Penguin.’ The Riddler’s intro was fun if a tad overdone, while Poison Ivy already has her ivy plant. The strength of the series lies with the noir feel. 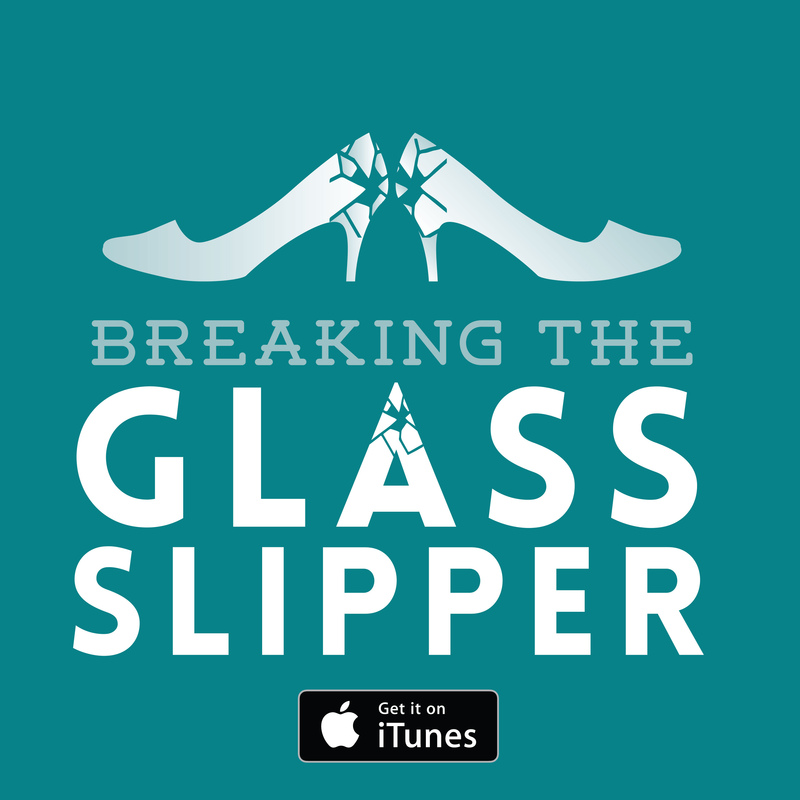 A detective series with fantastical elements and a character who is not just up against your normal amount of crime, but something far more sinister. Ben McKenzie and Donal Logue are very strong in the lead roles, their relationship will prove thoroughly intriguing as the story plays out. Even after only one episode I was 100% on Gordon’s side. If McKenzie managed to be likeable on The O.C. (terrible, terrible show), imagine what he could do in a show with actual substance?! Verdict: The pilot episode is a good half a season scrammed into 45 minutes, but it still manages to be worth it. A positive start for a show with a lot of promise.